Following the 2016 EsF Assembly, the Hyderabad, India, community has been working tirelessly to set up programmes to reach more children from low-income backgrounds. 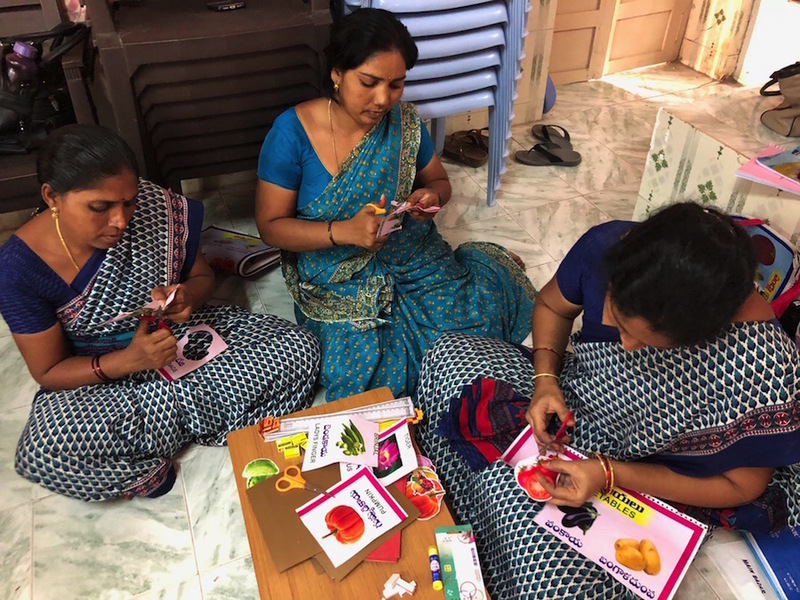 An early focus for EsF Hyderabad was early childhood care and education in Aanganwadi centers (early years settings in rural areas) in Andhra Pradesh, India, which lead to the launch of a new initiative called Community Rooted Education (CoRE). 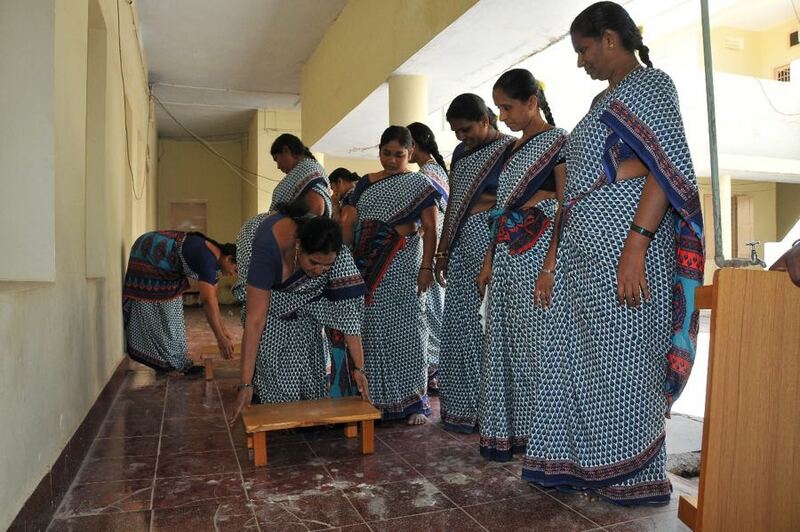 On the basis of a study of Aanganwadi centers and the National Early Childhood Education Framework, EsF Hyderabad developed a set of low cost Montessori materials and a training module to introduce the principles of Montessori practice. The programme, called Community Rooted Education, was presented at the World Congress in Prague and aroused a lot of interest from around the globe. It is a first introduction to Montessori principles with a focus on the preparation of the adult and the environment with the use of the School in a Box materials to aid the work of the child. 55 Aanganwadi teachers in Thullur district have now been trained in EsF Community Rooted Education. They have been introduced to the basic principles of Montessori practice. Classrooms are equipped with key materials focused on activities of daily living, sensorial, language and math. The 10-day training is followed by monthly 2-day workshops for the following 10 months. 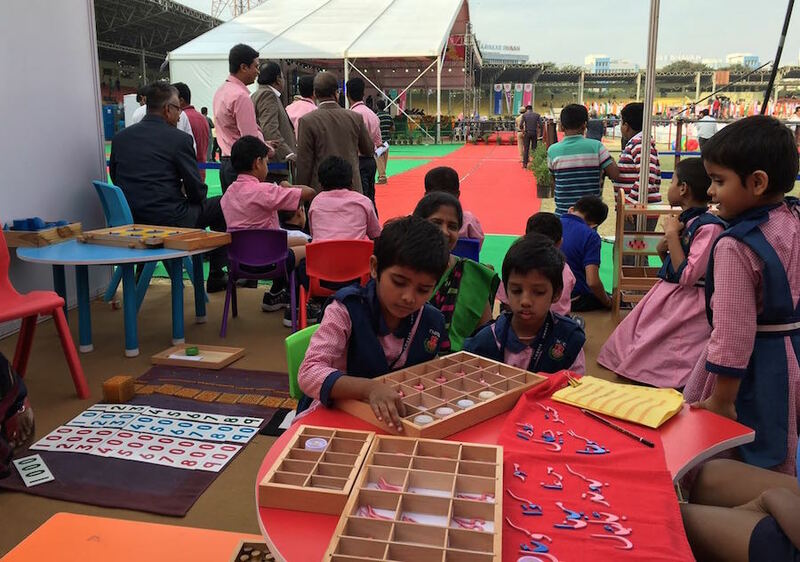 Additionally, a Montessori classroom has been set up for the children of an orphanage in a rural area, in collaboration with the Telangana Minorities Residential Educational Institutions Society (TMREIS). TMREIS adopted one orphanage in Hyderabad and sought the support of EsF Hyderabad in creating a Montessori environment for these children. Helen’s inspiring record of this programme can be found below. She continues to work with the children in the school in Hyderabad and consult with TMREIS as they move forward. EsF Hyderabad hopes to offer an orientation to Montessori principles to the staff of the Minorities schools in the near future. When officials from The Telangana Minority Residential Educational Institutions Society (TMREIS) met Philip O'Brien and Lynne Lawrence, Uma Ramani (primary trainer), Helen Mohan Elias and Moiza Rafath (both from the Montessori Training and Research Trust (MTRT)), in August 2016, during the Fifth Educateurs sans Frontières (EsF) Assembly in Hyderabad, their request was to bring high-quality education to the children in their care. Following a number of meetings, TMREIS committed to bringing Montessori principles to all of their residential campuses (204) and to implement Montessori Elementary programmes in a 5 campuses as a beginning pilot. In August 2017,TMREIS adopted one of the state-run orphanages which had over one hundred children between the age group of 3 to 14. Children above 10 years were sent to their residential schools. Children below 10 years were kept in one of the Hyderabad branches and MTRT was asked to set up a Montessori Environment for the children. We readily agreed to this heaven-sent opportunity and set up the environment within two days with whatever material was available across the counter and that we could make. The environment was inaugurated by the President of the TMREIS former Police Commissioner, Mr. A K Khan, IPS along with the other officials on 28th August 2017. The children were brought to the Montessori environment a day before the inauguration. They were in a very bad condition. They were malnourished and unwashed. They had skin lesions. They were unruly. They were first given haircuts and bathed and provided with new clothes. On the day of the inauguration which was the next day, they were given new uniforms and shoes. The children were very excited as they had never worn new clothes or shoes before. What caught my attention was that amidst all the chaos of the inauguration with people from the media and the government officials exchanging garlands, greeting each other with shawls and flowers and posing for pictures, nothing mattered to the children; they were in their own world fascinated by the material - the newly set up Montessori material. One part of me was crying for the way the material was being handled, but fortunately, the other part of me was able to recognize that these children were hungry for work. They did not mean to damage the material. It was the material that caught their attention, the media did not attract them, the important people did not attract them, beautifully painted walls did not attract them. The moment the room was opened the children pounced on the material as if they were in a life or death situation. Some of us, who were Montessori trained, immediately started showing them how to handle the material and how to work with it, only to discover that the children were not ready to listen. Things were not easy as we worked to set up daily routines and activities. Nobody wanted to work with these children - within one week, two teachers (one Montessori trained and the other a post-graduate) and three helpers left. The children had no order, no manners, and no discipline. They were not ready to follow instructions. They were very loud, verbally and physically. Their language and behavior was beyond anybody's control. It was common for them to use abusive language and beat each other. One day one boy beat another boy very badly, I took them both aside and said, "I'm so sad that you hurt him very badly, it must be so painful…" and even before I could complete what I was saying, the child who received the beating said, "No it is not hurting at all." At that moment, I realized how even pain is accepted as if it was a normal part of a these children's lives all the time. They had no feelings for each other's hurt and pain. Beating and being beaten up was their lifestyle. Montessori's first house of children was what glared at me, it was the same situation. Our strength was the outcome of the first Casa dei Bambini in San Lorenzo. Work therapy was the only solution. I set to work, to introduce the materials to the children, to set clear boundaries and hold high expectations with the help of two teachers (not Montessori trained), who were willing to work with the children, and two helpers, one each for the girls' and the boys' dormitories. Work, work and only work is what the children did, after that; more material, more presentations, more visitors, and a balanced diet. The children began to develop a sense of trust and a feeling of security. Except for a few children, most of them knew numbers and the letters of the alphabet in English. Working with the material was only a confirmation to them (and to us) that the children already knew the letter names and numbers. The best part was that working with the material was helping them calm down, it was helping them shed unwanted movements; handling the material with care brought about a sense of care, love and responsibility for things around them. These children never had any ground rules or order in their lives before. In the initial days, they would not listen to any instructions given and end up doing whatever they wanted to do. It looked as if they had decided not to respect or listen to the teachers. The constant complaint of the teachers was that "they don't listen to us - they behave as if they are deaf". Now, after two months, the children look much calmer, they are able to follow instructions and requests, to an extent, and are ready to take presentations. Initially the urge was to touch the material, manipulate it and play with it in whatever possible way; but, now, the children seem to have understood that manipulating the material in a particular way shows very interesting results. Initially, the urge was only to work but now the urge to learn is also experienced in most of the children. On 11th November 2017, TMREIS organized, for the first time, an annual meeting of the 204 minority schools they had established over the last two years. It was a big event with massive arrangements at the Lal Bahadur stadium in Hyderabad. The older children from grade 5, 6, 7 and 8 showcased their talents in a guard of honor, march past, mass drill and band. Awards were given to the children for achievements in various sports events. The new addition to the TMREIS organization was the orphans who are now called Montessori children. They were asked to show their work with the material. We were told that the Chief Minister (CM) of Telangana Sri K. Chandrashekhar Rao wanted to personally interact with the children about their work. The children are only just now beginning to settle and still with great difficulty. They are coming to terms with the new orders of their world such as sleeping on a cot with mattress, going through a hygienic regime of brushing their teeth and having bath daily. They are getting 4 meals a day with balanced diet. Their food consumption is huge, probably because they were used to getting food once in a while so they eat endlessly. Now slowly, with the guarantee of the next meal, the exuberant eating style and the quantity has come down. Building academic knowledge has not begun as yet and so I was deeply worried that the Chief Minister would not get good feedback from his academic questions from the children. What if he came to the conclusion that Montessori does not work and said so? I was praying that he did not come and needless to say my prayer was answered. The Chief Minister did not come, because of a sudden change of plans for reasons unknown. Except for me, the whole congregation was disappointed, including the children. For the children the Chief Minister is akin to God; they think of him more often than they would of anybody else. We set up a mock environment for the children and I invited a couple of other Montessori teachers to be on hand to explain the method and principles. The programme was graced by the Deputy Chief Minister, Home Minister, Education Minister and various other officials. The classroom set up for the Montessori children was viewed with considerable awe. Some of the officials, principals of schools, teachers, parents and children came to see something that looked so different from anything they had previously experienced. The material, the setup and the children attracted a huge crowd. They looked at us all as if we were an exhibit. Children worked with English, Hindi and Urdu movable alphabets. Some worked with geometry solids, pink tower, cylinder blocks, addition strip boards, multiplication and division boards to name a few activities. To my surprise, people were able to see the change in the children. The secretary of TMREIS, Mr. Shafiuallh, said that there was 360-degree change in the children. Some people said that they did not look like the same children that they had seen on the day of the inauguration. They could not believe that they were orphans and that they could sit in one place and work with the material. The children and those of us working with the children received royal treatment, like celebrities. This gave me assurance that there was noticeable change in the children. This is just the beginning…. MTRT has worked to bring Elementary trainer Greg McDonald to Hyderabad. TMREIS will be sponsoring several teachers to this training. We are also building a short training to introduce Montessori principles to other adults. In his workshop conducted by MTRT on the 4th of November 2017, Greg said that just as physical fracture of the bone has to be identified, fixed and allowed to heal, the psychical fractures and hurt of these children have to be identified and treated and allowed time to heal. With this understanding and the faith in the method we continue to work on the healing process. Additionally, EsF Hyderabad has focused on creating a "School in a Box" with materials for the foundations of literacy and numeracy. 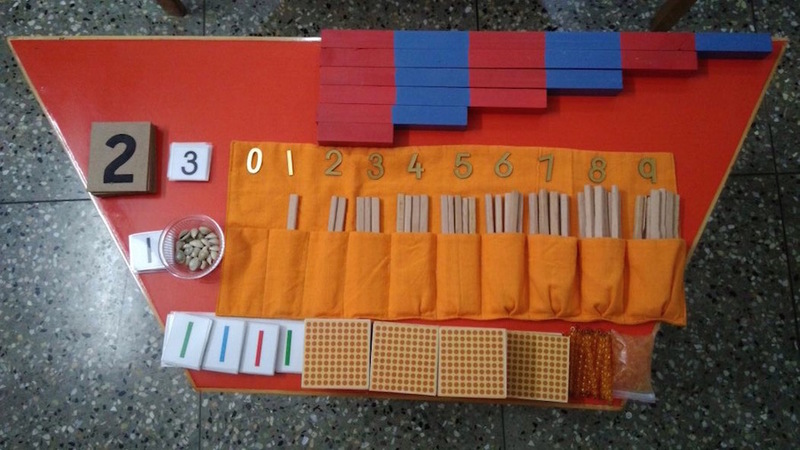 The kit, that costs less than 350 dollars, makes Montessori materials accessible to a large majority. The number rods will go to 10, even though it is not shown in the photo. Also emerging from the EsF Assembly in 2016 was an invitation to help supplement the training of Aanganwadi workers in Telangana. (Aanganwadi means courtyard and this is education and nutrition for children under the formal school age). On February 25th EsF Hyderabad offered training for workers from 26 Aanganwadis. The training on offer will be for 10 days in two 5 day sessions - the government offers these workers 6 days training per year. The focus is to provide them the basic principles of Montessori practice, introduce the use of some of the materials created in the format of a 'School in a Box' and provide the understanding for creating a prepared environment. The Aanganwadi workers will be mentored over the next year through monthly visits and workshops. There were over 55 participants - 50+ Aanganwadi teachers; and 5+ supervisors and instructors (who started on the first day as a formal duty, but showed up every day and stayed all day every day!). Kalpana Viswas (whose expertise in is in working in the rural areas offering a Montessori education) joined us on Wednesday and stayed for the rest of the session assisting with the work. Alongside the training - each centre will be renovated. Some of the learning is in the form of a song "What is Montessori?". No Montessori materials were introduced in the first 5 days of training. The focus was on the preparation of the adult and the environment by developing Montessori practices before introducing any materials. The three points of focus for the next few weeks of practice are Cleanliness, Order and Spoken Language. A handbook for practice has been created for the teachers and was well received and used for making notes by all. The training so far has been rigorous, compassionate, collaborative, respectful and joyous. The participants were all deeply touched and shared how life changing these days have been. The supervisors, project director and local administrators all seem to be invested.